November 11, 2016 -- The New York-Penn League has announced its schedule for the 2017 season, which will begin on Monday, June 19th. The Brooklyn Cyclones will open their 17th season against Staten Island at Richmond County Bank Ballpark before opening the home slate the following date at MCU Park. The 2017 season will mark the first in which their cross-bridge rivals will not be known as the Yankees. Their new moniker will be announced in the coming weeks. The most noticeable difference to the 2017 schedule will be the Friday start time of 6:40 PM for all Cyclones home games, in hopes of being able to complete the game prior to the start of the world famous Coney Island Fireworks display. In recent years, these post-game fireworks shows have become more along the lines of an in-game fireworks show and the change in start time hopes to alleviate this issue. Another change to the schedule, which was adopted across the New York-Penn League, is that teams will not play all 13 other clubs in the NYPL. For example, Brooklyn does not play Auburn, Batavia or Williamsport in 2017. Season ticket holders will be receiving information about their options for the 2017 season and group tickets, as well as mini plan information, will be available in the weeks ahead. For more information please contact the Cyclones ticket office at 718-37-BKLYN. On Friday, November 25th, from 8:00 a.m.-10:00 a.m., Season Ticket Holders who show their ID card will receive 40% off regularly priced merchandise and all fans will get 35% off regularly priced merchandise. After 10 AM, there will be a 35% discount until noon, a 25% discount until 2:00 PM and 20% off until 5:00 PM. 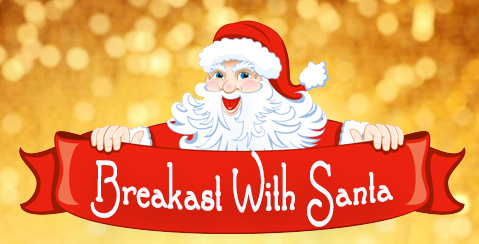 Head to MCU Park on Saturday, December 17th for Breakfast with Santa starting at 10 AM. Enjoy a pancake breakfast, and get your photo with Santa for just $10 per person. You must be pre-registered, no walk ins will be granted admission. On Sunday, November 20th the Cyclones will hold their 2nd Annual Holiday Season Garage Sale. The event, which will run from 9 AM - 12 PM, will give fans the chance to scoop up Cyclones promotional items like jerseys, hats, lunch boxes and bobbleheads for as low as $1. As well as other great Cyclones collectibles and memorabilia. Former Cyclones Amed Rosario and Brandon Nimmo were named New York Mets Organizational Co-Players of the Year, while LHP and 2015 Cyclones P.J. Conlon was named the Organizational Pitcher of the Year. OF Desmond Lindsay was named 2016 Sterling Award Winner for the Cyclones. Israel defeated Great Britain at MCU Park on Sunday evening by the score of 9-1 to win the Brooklyn Qualifier of the World Baseball Classic. Israel now advances to Seoul, South Korea and will open pool play on March 7th. While the 2016 version of the Cyclones may have struggled with the bats, three former 'Clones finished the season tops in their league in batting average. T.J. Rivera, who played in Brooklyn during the 2011 season, finished tops in the PCL. Phil Evans, a 2012 & 2013 Cyclone, led the EL in batting and Tomas Nido, in Brooklyn in 2013 & 2014, led the FSL. While the 2016 Brooklyn Cyclones struggled offensively, Harol Gonzalez solidified his place as one of the best pitchers in the New York-Penn League, and one of the best in Cyclones franchise history. The 21-year-old righthander finished the season tops in the New York-Penn League with a 2.01 ERA, first in strikeouts with 88 and third in the league with seven wins. Israel has punched their ticket to Sunday evening's World Baseball Classic Qualifier Championship Game with a 1-0 win over Brazil on Friday afternoon. Starting Friday at 4 PM and running through 11:59 PM on Saturday evening the Cyclones will waive all ticket fees for Sunday's Championship game at 6:00 PM with post-game fireworks. With the World Baseball Classic Qualifier to be played at MCU Park from Thursday - Sunday, here is a look at the prohibited items at the ballpark. There will be additional security measures in effect at the ballpark for the tournament so we ask all fans to please be patient as we work to keep everyone in attendance safe. Rosters for the 2016 World Baseball Classic Qualifier to be played at Coney Island's MCU Park this September have been announced and will feature some familiar faces as former Cyclones Ike Davis and Josh Satin will play for Team Israel, and Blake Taylor will play for Team Great Britain. The upcoming WBC Qualifier in Brooklyn will be held from September 22nd-25th at MCU Park, and will feature the national teams of Great Britain, Israel, Pakistan and Brazil, which will once again be managed by Hall of Famer Barry Larkin. Tickets are just $15 a game, or $60 for a tournament pass, and on sale-now! On Sunday, September 4th the Cyclones will close out their 2016 home schedule when they take on the Staten Island Yankees at 4:00 PM. It's Fan Appreciation Day and fans are encouraged to arrive early as Cyclones Players will be at the front gates to sign autographs when gates open at 2:30 PM. The Cyclones Box Office will have special Holiday hours over Labor Day Weekend. The Surf Avenue Box Office will be open from 10 AM - 3 PM (Friday), Noon - 4 PM (Saturday) and 11 AM - Game Time (Sunday). Tickets are always available at BrooklynCyclones.com. The Cyclones return home on Monday, August 29th to open a three-game series with the Auburn Doubledays. It's one of the last opportunities to visit the Ballpark on the Boardwalk this summer. Monday night the first 2,000 fans in attendance will receive a Cyclones Fleece Blanket and after the game EVERYONE gets to run the bases. Tuesday night features post-game fireworks, and on Wednesday night all tickets are just $10. The Cyclones open up a three-game series with the Auburn Doubledays on Monday Night at MCU Park. The first 2,000 fans in attendance will receive a Cyclones Fleece Blanket plus EVERYONE gets to run the bases post-game. Tickets start at just $10 and are on-sale now. Head to MCU Park on Friday, August 26th for the 17th Annual Heroes Baseball Classic featuring the NYPD and FDNY. Tickets are just $10 in advance for $15 on game day. On Thursday, August 25th the Brooklyn Cyclones will celebrate Christmas in August and the first 2,500 fans in attendance will receive an Ugly Holiday Sweater jersey. On Tuesday, August 23rd, Astoria Bank will collect new school supplies to help children in need to start school with the right tools. 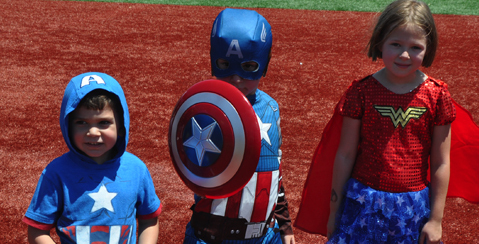 The Cyclones return home on Tuesday, August 23rd for Super Hero Day at MCU Park. There will be a pre-game costume parade around the field and MidTown Comics will be distributing FREE comics to fans in attendance. On Tuesday, August 23rd the first 2,000 fans in attendance will receive a Lucas "Duda Smash" Bobblehead as we celebrate Super Hero Night. There will also be comic book giveaways courtesy of Mid Town Comics and post-game fireworks! Ring of Honor Wrestling will return to Brooklyn, New York on Saturday, August 27th, 2016 to present Field of Honor 2016 at MCU Park on Coney Island. Tickets start at just $25. The Cyclones (Stimpy) and Lake Monsters (Ren) jerseys from our 90s Nickelodeon Night featuring Ren & Stimpy are up for auction now. Start your bidding and best of luck. SS Colby Woodmansee, RHP Harol Gonzalez and 1B Pete Alonso have been named to the NYPL All-Star Team and will represent the Cyclones on Tuesday, August 16th in Hudson Valley. On Sunday, August 14th the Cyclones will celebrate Late Night in Brooklyn - a tribute to Late Night TV - and fans will be able to get their hands on a Brooklyn Under the Stars jersey through this special offer. Sunday is FunDay at MCU Park with a pre-game catch on the field, post-game kids run the bases and the first 1,500 fans in attendance will receive a Cyclones HandsHigh T-Shirt featuring their unique design. The Cyclones take on the West Virginia Black Bears on Saturday night for Augtoberfest at MCU Park. The first 2,000 fans in attendance will receive a Cyclones BC Stein and there will be post-game fireworks. 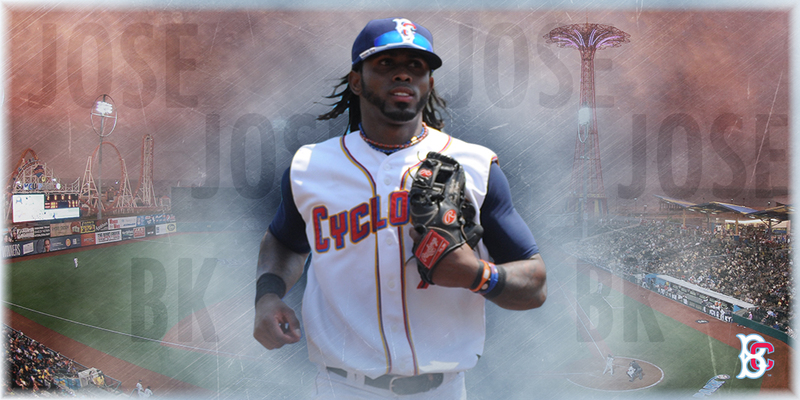 Jose Reyes, four-time National League All-Star, will begin a Major League Rehabilitation Assignment with the Brooklyn Cyclones (A) of the New York-Penn League on Thursday, August 11th through Saturday, August 13th. On Friday, August 12th the Cyclones will host Military Appreciation Night at MCU Park featuring post-game fireworks. In addition, the first 2,000 fans in attendance will receive a pair of Cyclones Aviator Sunglasses. 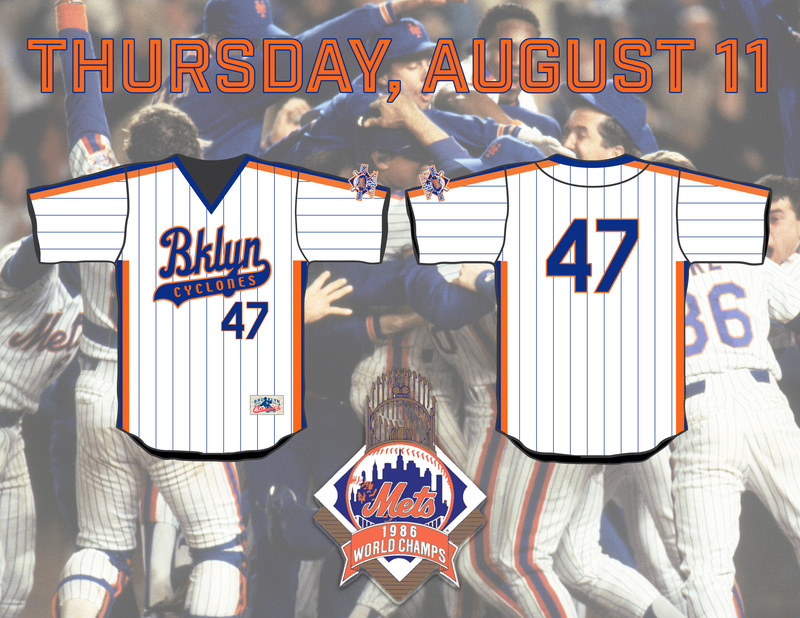 On Thursday, August 11th the Cyclones will host an Amazin' Jersday Thursday when the first 2,500 fans in attendance will receive a Cyclones jersey inspired by the 1986 Mets design, plus fans will have the chance to meet Jesse Orosco during the game. On Wednesday, August 10th the Cyclones will celebrate 90s Nickelodeon Night featuring Ren & Stimpy. As part of the night's festivities, we are offering a limited edition package that includes a field box ticket and Ren & Stimpy Bobblehead for just $25. The Cyclones return to Coney Island on Tuesday, August 9th to begin a six-game homestand. To celebrate we will be waiving all ticket fees from Tuesday at 10 AM - Wednesday at 10 AM. On Tuesday, August 9th, the first 2,000 fans in attendance will receive a Joe Torre Bobblehead, featuring the Hall of Famer in his Cadets Baseball uniform from his day of growing up in Brooklyn. The former Mets & Yankees manager will also be in attendance for our pre-game Celebrity Softball Game to benefit the Safe at Home Foundation. On Wednesday, August 10th the Brooklyn Cyclones and Nickelodeon will partner for 90’s Nickelodeon Night featuring Ren & Stimpy. Both the Cyclones and Lake Monsters will wear special jerseys for the occasion and you can get a limited edition Ren & Stimpy bobblehead. 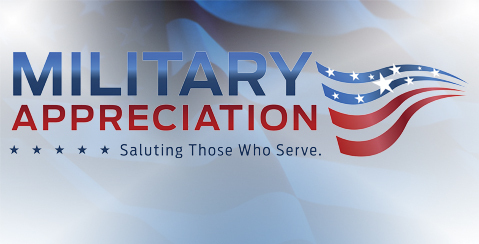 Starting Friday, August 5th at 10 AM, the first 100 active or retired members of our Armed Forces to show military ID will receive two (2) free tickets to our game on Friday, August 12th for Military Appreciation Night. The evening will feature post-game fireworks and the first 2,000 fans in attendance will receive Aviator Sunglasses. 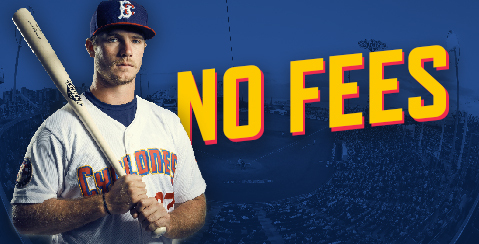 Today is August 1st, and the first of the month means no fees on Cyclones tickets! Starting today at 3:00 PM and running through Tuesday at 3:00 PM we will waive all ticket fees for purchases of game tickets for August 2nd - 14th. The Cyclones and IronBirds will close out their three-game series with a special 11:30 AM start on Tuesday, August 2nd. Call in sick and head to the beach for some baseball on the boardwalk! 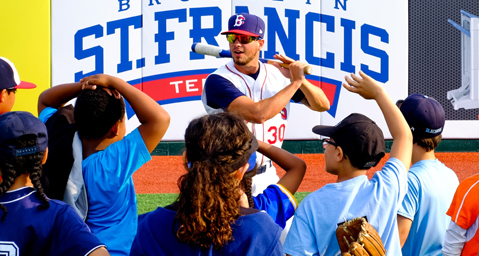 Brooklyn Cyclones Baseball Camp offers kids between the ages of 7-14 the chance to learn the fundamentals from Cyclones players and coaches with an emphasis on FUN. The camp runs from August 9th-12th and includes tickets to two Cyclones games. On Monday, August 1st the Cyclones will take on the Aberdeen IronBirds in the middle game of a three-game set. 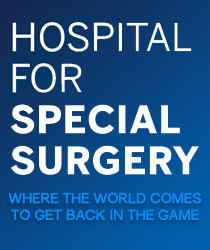 The first 2,000 people in attendance will receive an iPod Amplifier and post-game EVERYONE gets to run the bases. The Cyclones will celebrate New York's Finest on Monday, August 1st on NYPD Night. As part of the festivities, anyone who shows a Law Enforcement Badge at the Box Office will receive a FREE Ticket. Looking back on the 2015 New York Mets, the turning point of the season was a deal that never happened and kept Wilmer Flores in the orange and blue. 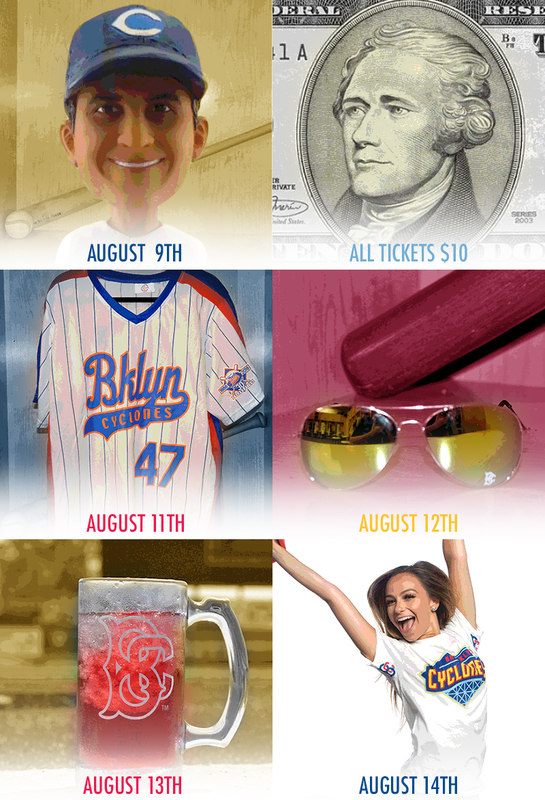 On July 31st, the Brooklyn Cyclones will commemorate this unforgettable few days with a "From Tears to Cheers Wilmer Flores Bobblehead" for the first 2,000 fans in attendance. On Sunday, July 31st, Coney Island Native and Brooklyn Nets guard Isaiah Whitehead will be at MCU Park to sign autographs for fans. Whitehead starred at Lincoln High School on Coney Island and with Seton Hall before being selected in the 2016 NBA Draft. Head to the ballpark on Tuesday, July 26th for Edgardo Alfonzo bobblehead night at the ballpark. The first 2,000 fans in attendance will receive a "Fonzie" bobblehead courtesy of NYU Lutheran...plus, Post-Game Fireworks! BROOKLYN, NY – JULY 25, 2016 – With heavy rains and dangerous winds expected to come through Coney Island tonight, the expected game between the Staten Island Yankees and Brooklyn Cyclones was been postponed. It will be made up as part of a doubleheader on Tuesday, July 26th starting at 5:30 PM. Gates will open at 5:00 PM and the Edagardo Alfonzo Bobbleheads will be distributed at that point. There will also be post-game fireworks following the two, seven-inning games. Tickets for Tuesday's game will be valid for access to both games. Those with tickets for Monday’s game can exchange them at the MCU Park Box Office for Tuesday’s game, or any game for the remainder of the 2016 season, based on availability. The MCU Park Box Office will open on Tuesday at 10 AM and is also available by calling 718-37-BKLYN. The Cyclones and Yankees will square off in the "Battle for the Bridge" from Sunday, July 24th - Tuesday, July 26th at MCU Park. There are great giveaways, fireworks shows and jersey off the back raffles, and tickets start at just $10. On Sunday, July 24th Mike Piazza will be inducted into the National Baseball Hall of Fame, becoming just the second player to go into The Hall as a Met. If you can't make it to Cooperstown, head to MCU Park for our special viewing party with gates opening at 1:00 PM and then stick around and see the Cyclones take on the Yankees at 4:00 PM. The Cyclones return to MCU Park on Thursday, July 21st for the second Jersday Thursday of the season and Irish Night. But we've also got fireworks (Friday & Saturday), Mike Piazza H.O.F Day (Sunday), Edgardo Alfonzo Bobblehead (Tuesday) and the Cyclones vs. Yankees (Sunday-Tuesday). On Saturday, July 23rd the Cyclones will take on the Abdereen IronBirds on Star Wars Night at MCU Park. The fame will feature pre-game, in-game and post-game Star Wars entertainment and the first 2,000 fans in attendance will receive a "glowing" BC Cap. The Brooklyn Cyclones have always prided themselves on providing a family first atmosphere and on July 22nd we will need your help in taking care of one of our own. Jeff Reynolds, who played for the Cyclones in 2012, along with his newborn son are currently raising funds to find a cure for Pearson Syndrome. The Donnie Wahlberg Bobblehead and appearance, originally scheduled for Friday, July 15th has been rescheduled due to a change in Mr. Wahlberg's filming schedule for "Blue Bloods." He will now be in attendance on Thursday, July 21st when the Cyclones take on the Aberdeen IronBirds. You can still buy a ticket and receive a limited edition bobblehead. Irish eyes will be smiling on Thursday, July 21st when the first 2,500 fans in attendance will receive a Shamrock Hockey Jersey courtesy of Budweiser. Tickets start at just $10. FISHKILL,NY – July 18, 2018 – The Cyclones snapped their four-game losing skid with a 6-3 win over the Hudson Valley Renegades on Monday afternoon at Dutchess Stadium. LHP Taylor Henry recorded the final four outs of the game, including a strikeout with the bases loaded to escape the eighth inning, to collect his fourth save of the season. With the early morning start time of just after 11:00 AM, it seemed like both offenses hit the snooze button, sleepwalking their way through the first three innings. But in the bottom of the fourth the Renegades seemed like they would break the scoreless tie. Jake Fraley singled and stole second base with two outs before Nathaniel Lowe singled to right field but Gene Cone fielded quickly and came up firing and was able to throw out the speedy Fraley at the plate for the final out of the frame, keeping this scoreless heading into the fifth. It was in that fifth inning that the Renegades were finally able to break the scoreless tie. Angel Perez led off the frame with a single and stole second base to move himself into scoring position. The Hudson Valley DH would then move over to third on a ground out and came home to score on a fielder’s choice when Brooklyn third baseman Blake Tiberi’s throw to the plate was a tad late as Perez slid home safely with the game’s first run. But in the top of the sixth inning the Brooklyn bats awoke from their slumber, taking control of the game. The rally started innocently enough with a two-out walk of Pete Alonso before Blake Tiberi hit a ground rule double that put runners on second and third for Colby Woodmansee. The Cyclones shortstop took advantage of the scoring change with a frozen rope to left field, plating a pair and giving Brooklyn a 2-1 lead. For the slumping Cyclones, it was their first RBI in 29 innings. But the ‘Clones weren’t done there, Jacob Zanon had an RBI single and Jay Jabs ripped an RBI double to make it 4-1. The Cyclones lead would expand in the seventh when Alonso smashed a two-run blast over the centerfield wall to push the Brooklyn advantage to 6-1. RHP Erik Manoah (3-1) made the start for Brooklyn and left after tossing 5.0 innings, allowing just one run on four hits while walking one and striking out one. He handed the ball over to Raul Jacobson, who was nearly spotless in the sixth and seventh but ran into trouble in the bottom of the eighth. The rigthhander allowed an RBI single to Garrett Whitley that made it 6-2 and eventually was chased from the game with the bases loaded and two outs in the bottom of the eighth. Taylor Henry trotted in from the bullpen and struck out Nathaniel Lowe to end the threat and keep the Cyclones ahead. The Renegades plated a single run in the ninth after Henry allowed a single and a walk with a wild pitch to start the frame, but the Brooklyn southpaw was able to limit the damage and closed out a 6-3 win. Satruday, July 16th will be Relay for Life Night at MCU Park as the Cyclones join forces with the American Cancer Society to raise funds in the fight against cancer. The team will be wearing special jerseys that will be raffled off with proceeds to benefit Relay for Life. In addition, stick around post-game for a special fireworks show. CyclonesAuthentics.com is your one-stop-shop for Cyclones game-worn items and memorabilia. Bid on speciality jerseys, game worn items and more right off the back of the future big league stars of tomorrow. On Friday, July 15th we will celebrate the 100th Annviersary of Municipal Credit Union (MCU). The first 2,000 fans in attendance will go home with a portable cell phone charger courtesy of MCU and we will also have special post-game fireworks! Our first Jersday Thursday of the season will be Thursday, July 14th when the Cyclones take on the Lowell Spinners. The first 2,500 fans in attendance will receive a Brooklyn Bridge Jersey courtesy of GEICO. Join the Cyclones on Wednesday, July 20th for the annual Charity Golf Outing & Dinner at Dyker Beach Golf Course starting at 1:30 PM. All proceeds will benefit the New York-Penn League Charitable Foundation. On July 3rd the Brooklyn Cyclones changed their name to the Coney Island Franks to celebrate the 100th Anniversary of Nathan's Famous. Now you can get your hands on the on-field jerseys, caps and t-shirts that celebrated the milestone. The on-field New Era fitted caps are now available for pre-order as we wait to restock. Thursday served as the first of only five off days of the season for the Cyclones and many of the 2016 Boys of Summer used the downtime to get familiar with their new home...New York City. Did you binge watch "Fuller House" already and need more Tanner Family in your life? Well, we're here to help. The Brooklyn Cyclones will pay homage to San Francisco's most-famous residents on July 9th with special on-field jerseys and a John Stamos bobblehead! The Cyclones return home on Friday, July 8th to take on the Hudson Valley Renegades at 7:00 PM. Start your weekend with a BOOM thanks to post-game fireworks that will light up the Coney Island sky. Hot Dogs are as synonomous with Coney Island as the beach or roller coasters. On Sunday, July 3rd the Cyclones will celebrate this unique connection with a one-day-only name change as they become the Coney Island Franks in honor of the 100th Anniversary of Nathan's Famous here on Coney Island. To celebrate the 100th Anniversary of Nathan's Famous, the Brooklyn Cyclones will change their names to the Coney Island Franks - for one day only - on Sunday, July 3rd. As part of the celebration, you can purchase a pre-game All-You Can Eat Hot Dog package - including a game ticket - for just $30. This Holiday Weekend head to Coney Island for some Baseball on the Beach. The Cyclones take on the Hudson Valley Renegades on July 1st, 2nd and 3rd featuring post-game fireworks and great giveaways each day. Tickets start at just $10. Seinfeld Night III will be held on Saturday, July 2nd when the Cyclones take on the Connecticut Tigers. The first 2,000 fans in attendance will receive a Roger McDowell "2nd Spitter" Bobblehead...and that's just the beginning! The ever-popular Seinfeld Night 3 will be coming to MCU Park this weekend when the Cyclones take on the Tigers at 6:00 PM on Saturday. The first 2,000 fans in attendance will receive a Second Spitter Bobblehead, J. Peterman will be in attendance to meet and greet fans, and we've got non-stop Seinfeld entertainment all game long. How can you get involved? Find out here. Spend your 4th of July Weekend at MCU Park with Fastballs & Fireworks as the Brooklyn Cyclones take on the Connecticut Tigers on July 1st, 2nd and 3rd with great giveaways and post-game fireworks each night. To make things even better, we will waive all ticket fees if you use code THINKSUMMER. JOSE! JOSE! JOSE! in BK! BK! BK! The New York Mets today announced that the club has signed free agent infielder Jose Reyes to a minor league contract. He will report to the Brooklyn Cyclones (the Mets' New York-Penn League Class A affiliate) and is expected to play with the team on Sunday (4:00 PM) and Monday (7:00 PM) against the Hudson Valley Renegades. Reyes played one game with Brooklyn back in 2011 as part of a rehabilitation assignment and went 1-for-3 with a run scored and a double. 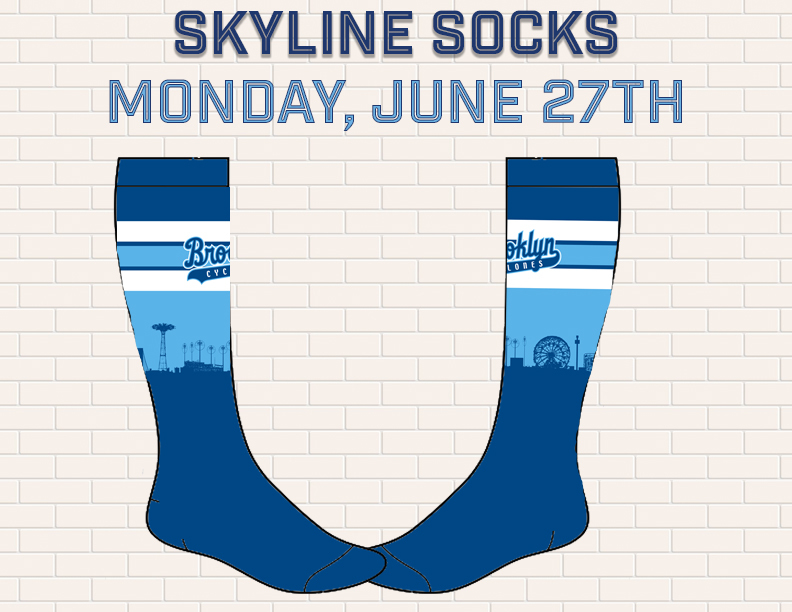 Represent the Cyclones from head to toe thanks to our Coney Island Skyline Socks giveaway on Monday, June 27th. The first 2,000 fans in attendance will go home with these stylish socks that feature the familiar sights of Coney Island. 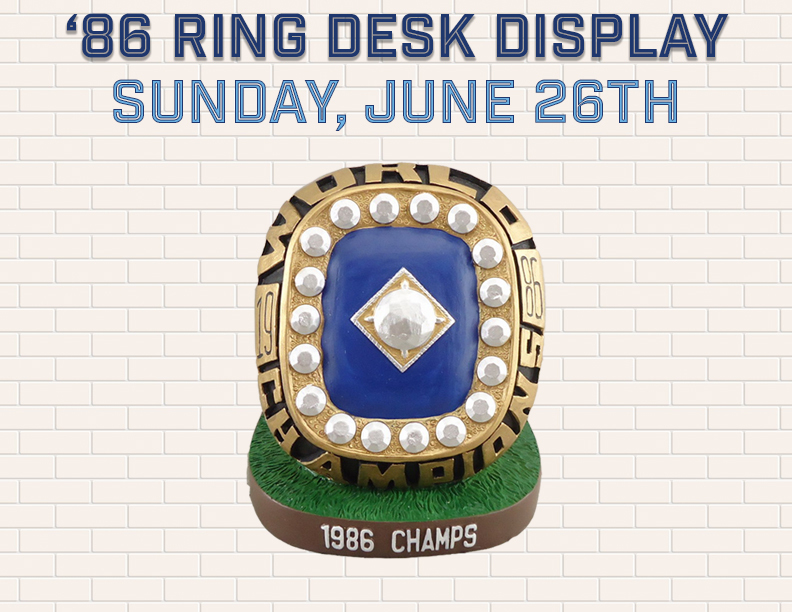 On Sunday, June 26th the first 2,000 fans in attendance at the 4:00 PM game between the Cyclones and Hudson Valley Renegades will receive a 1986 Championship Ring Desk Display. It's also a Sunday Funday, so fans will be invited to participate in a pre-game catch on the field and post-game kids will be able to run the bases. The Cyclones return to Coney Island on Saturday, June 25th to take on the Hudson Valley Renegades at 6:00 PM. It's a Saturday night, and that means post-game fireworks. Start your summer with a BOOM at MCU Park. The annual Brooklyn Cyclones 5k Run to benefit the YMCA will be held on Saturday, July 23rd along the famous Reigelmann Boardwalk in Coney Island. Register before June 26th and save $20, as compared to race day. In a little over a year, Michael Conforto went from roaming the outfield at MCU Park to playing in the World Series for the New York Mets. On Monday, June 20th the first 2,000 fans in attendance when the Cyclones take on the Tri-City ValleyCats will receive a Michael Conforto Bobblehead courtesy of MCU. Celebrate Father's Day at MCU Park when the Cyclones take on the Tri-City Valley Cats at 4:00 PM. The first 2,000 fans in attendance will receive a Cyclones duffle bag and EVERYONE is invited to head to the field pre-game for a chance to have a catch on the field starting at 3:00 PM. Burger Records, one of the most innovative record labels in the country, will hold the first-ever Burger Beach Bash NYC at MCU Park this summer on June 18th. Tickets cost just $15 and are on-sale now! As part of our celebration of Opening Day, the Cyclones will donate all ticket fees for tickets purchased through BrooklynCyclones.com - starting today at 10 AM and running through Saturday at 10 AM - to local military as part of our Military Appreciation Night. The Cyclones will also match the funds raised dollar for dollar. The Cyclones will open the 2016 season on Friday, June 17th against the cross-bridge rival, the Staten Island Yankees. Start your summer with a BOOM as the legendary Coney Island Fireworks light up the Brooklyn sky after the game. Tickets start at just $10 and are on sale now! As fans pour into MCU park for Opening Day this Friday, June 17th to watch the Cyclones take on the Staten Island Yankees, they will also get the pleasure of watching twenty year old RHP Gabriel Llanes lead from the mound as the Cyclones’ Opening Day starter. With Opening Day set for Friday, June 17th the Cyclones have announced their preliminary roster featuring some familiar faces, as well as some recent draft selections that will be new to Brooklyn. Single-game tickets for the 2016 season are on sale now. Get your seats for the great giveaways, unforgettable theme nights and breathtaking firework displays all summer long! Start planning your summer now and be a part of another unforgettable season at MCU Park. Star Wars Night will be held on Saturday, July 23rd and is sure to be one of the most popular games of the summer. Now, for a limited time, you can get a ticket for the game, glow in the dark t-shirt and light saber for just $25 as part of our Star Wars Night Package. On Sunday, May 22nd the 44th Annual NYPD vs. FDNY Football Game will return to the five boroughs when New York's Finest battle New York's Bravest on the gridiron at MCU Park. Tickets are just $20, with proceeds to benefit local charities, and include a ticket to a 2016 Cyclones game. It's never too early to start planning for those summer nights at the Ballpark on the Boardwalk. Group tickets for the 2016 season are on sale now, and this year groups of 15 or more are eligible for additional perks, and groups of 20 or more can receive discounted tickets. The Luxury Suites and Brooklyn Rooftop offer million dollar views at rent controlled prices and are the perfect setting for corporate functions, or a celebration among friends. MCU Park will have a new look for the 2016 season thanks to the all-new "Backyard" located just beyond the right field wall. This area will be the most unique vantage point in the ballpark and provides the perfect setting for a group outing. Registration is now open for the 3rd Annual MCU Youth Baseball / Softball Clinics. The clinics, which are open to children 7 - 14 years of age, are free of charge and will be held on Monday, June 20. Tuesday, July 26, and Wednesday, August 24 prior to that evening's Cyclones game. The Family Sunday Pay-One-Price Plans offer the best value in all of New York City. 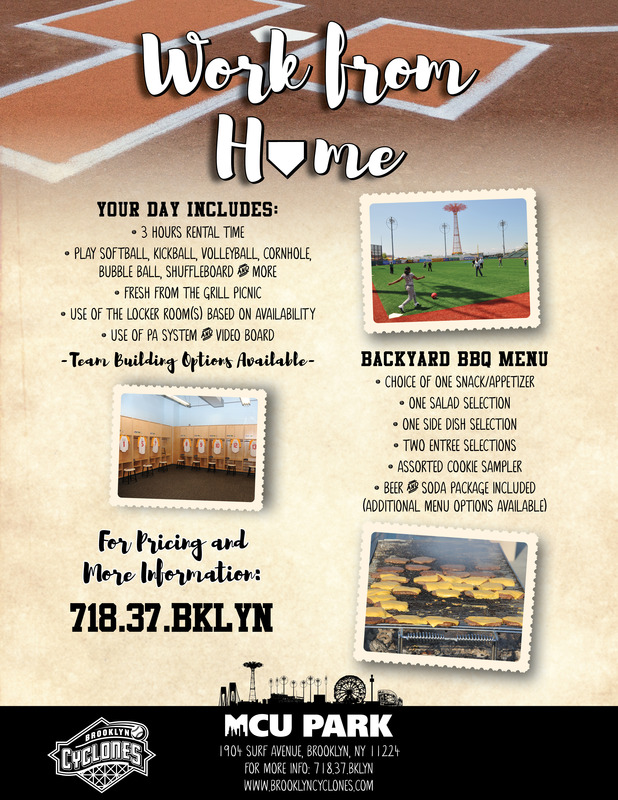 For every Sunday home game you can purchase plans that include a field box ticket, $5 voucher good for food, beverages or merchandise and FREE limited-edition t-shirt all for just $20 a person. Seinfeld Night III will be coming to MCU Park on Saturday, July 2nd. This year's game will feature an appearance from John O'Hurley (J. Peterman) and a limited-edition bobblehead / t-shirt package on sale now for just $35. Looking back on the 2015 New York Mets, the turning point of the season was a deal that never happened and kept Wilmer Flores in the orange and blue. On July 31st, the Brooklyn Cyclones will commemorate this unforgettable few days with a "From Tears to Cheers Wilmer Flores Bobblehead" for the first 2,500 fans in attendance. On Saturday, July 16th the Brooklyn Cyclones will join in the fight against cancer by hosting "Relay for Life Night" at the ballpark. Fans can make a donation to American Cancer Society's Relay for Life, and have the name of a loved one placed on the jersey in honor of their courageous battle against this dreaded disease. On Sunday, July 24th the Cyclones will celebrate Mike Piazza's induction into the National Baseball Hall of Fame. As part of the festivities you can take advantage of our limited edition 31 pack - complete with game ticket, food voucher, t-shirt and bobble home run apple for just $31. Can't make it to Cooperstown for Mike Piazza's Hall of Fame Induction? Watch the ceremony live at MCU Park as part of Hall of Fame Day presented by the National Baseball Hall of Fame & MLB Network. Each season, our Jersday Thursday giveaways are some of our most popular nights at the ballpark. This year we have four all-new designs that are sure to be a hit with fans yet again. Want to make sure you get all four? Guarantee it by purchasing our Red, White & Blue partial season plan. The Brooklyn Cyclones will hold auditions for the Beach Bums on Saturday, April 30th at MCU Park. 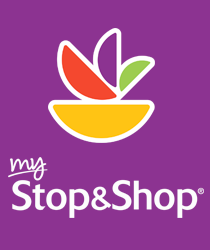 If you are a fun, energetic, friendly person looking for a unique summer job this is the perfect opportunity for you! On Tuesday, May 3rd the Brooklyn Cyclones will host their 4th Annual Education Through Baseball Day at MCU Park. This event is specifically designed for schools to attend, and focuses on educational components using the game of baseball as the tool. Gear up for baseball season with a special 35% off sale at Cyclones City on Friday, March 24th and Saturday, March 25th. Season ticket holders will receive 50% off in store ONLY when they show their STH membership ID. Since their inception in 2013, Pee Wee's Dance Crew has become one of the most popular parts of our in-game entertainment at MCU Park. This year's auditions will be held on Sunday, May 1st with registration starting at 9:00 AM. Boys and girls between the ages of 8-12 are eligible to audtion. Starting on Tuesday, March 1st, we will be selecting daily winners who will receive great Cyclones prizes...consider it Spring Training for Cyclones fans. In order to be eligible, you must be a full season ticket holder who has paid in full. The earlier you renew, the more chances you have to be a winner! FILL THE HOUSE PACKAGE ON SALE NOW! On Saturday, July 9th the Brooklyn Cyclones will host Full House Tribute Night, what is sure to be one of the most popular nights of the season. Want to get your tickets now? You've got it dude! For a limited time you can take advantage of our Fill the House offer which includes a field box seat, replica jersey and guaranteed John Stamos bobblehead for just $40. The Cyclones have announced their coaching staff for the upcoming season, and will once again be led by manager Tom Gamboa for the '16 campaign. He will joined on the bench by Edgardo Alfonzo (bench coach), Billy Bryk, Jr. (pitching coach) and Sean Ratliff (hitting coach). PARTIAL SEASON PLANS ON SALE NOW!!! Partial Season Plans help you pick a set of games that best suit your interest and schedule. Find one that's right for you and join the Cyclones for a summer of great baseball, thrillining entertainment, exclusive benefits and unforgettable nights at the ballpark. 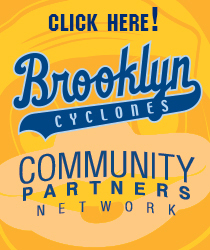 The Brooklyn Cyclones School Fun-Raising program is a great way for students, teachers, parents and faculty to come together and enjoy a night at the ballpark while also raising money for supplies and other programs for your school! The Brooklyn Cyclones are currently hiring for several positions with the club for the 2016 season. Summer internships are a great way to begin your career in sports and have fun while doing it.